Composer Larry Nelson (left) talks about his piece, Moonbow. Mélomanie capped its season with one of its most eclectic programs to date. Sunday’s concert treated its audience to a Delaware premiere, a fiery Latin tango and several interesting representatives of the Baroque era. Moonbow, the second premiere of the season, is a commission from Larry Nelson, a colleague of Mélomanie flautist Kimberly Reighley at West Chester University. In case you’re wondering, a moonbow is a rainbow produced by light reflected off the surface of the moon (rather than from direct sunlight) refracting off moisture in the air. The subject matter fits nicely with Nelson’s fascination with timbre, a motivating factor in his work. The piece consists of 13 sections, each flowing into the next and exhibiting a wide variety of musical styles. There’s a blues chorus, a pensive “cello float” and a very un-Bach-like contrapuntal section requiring each instrument’s participation. It was pleasing to hear Richardson’s harpsichord step out from its usual supporting role. One section — Angelic over vamp I and II — had the instrument chopping chords that were tonally distinct from the rest of the ensemble. Richardson also concluded the piece, playing in gospel style. The piece is a demanding one, and each member of the ensemble contributed a strong performance. Argentina for flute, violin and cello by Christopher Caliendo offered a stark contrast to the introspective quality of Moonbow. Once again, Caliendo proves he knows how to write for the flute. Reighley’s fiery playing carried the piece as it got support from a punchy accompaniment of Latin rhythms provided by violinist Christof Richter and cellist Douglas McNames. 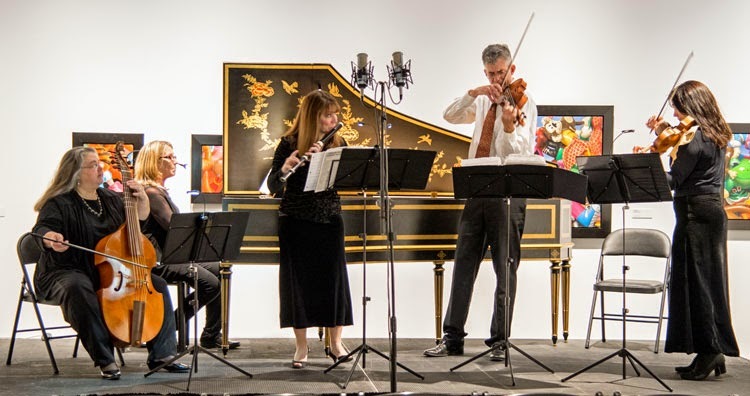 The Baroque was well-represented with works by Boismortier, Telemann and Vivaldi. 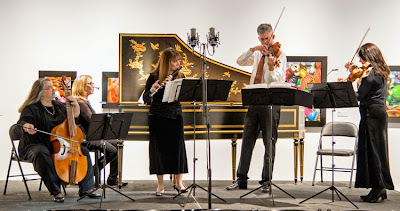 The participation of guest artist violinist Daniela Pierson allowed the ensemble to program works it would not normally have been able to perform. Guest violinist Daniela Pierson (right) performs with Mélomanie. The concert opened with the Sonata IV in D Major (Op.34/4) by Joseph Bodin de Boismortier. Also known as the “French Telemann,” Boismortier took advantage of the demand for technically accessible and melodious music by the growing population of amateur musicians in the 18th Century. Partly for this reason, his works have not received the respect they deserve. The musicians gave a sparking performance of this short but aesthetically pleasing work that demonstrated the composer’s command of the rules of harmony and counterpoint as well as his gift for melody. Violinists Richter and Pierson teamed up for Telemann’s Gulliver Suite, another piece written for amateur musicians. Swift’s satire gave Telemann the idea for a programmatic dance suite, each of whose movements recalls Swift’s characters with musical gestures. Richter and Pierson provided a nice interplay in the fifth and final dance — a loure —which contrasted the civilized Houyhnhnms (Richter) with the untamed Yahoos (Pierson). 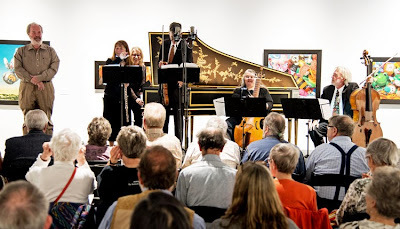 The concert closed with a performance of Vivaldi’s Sonata XII in D Minor (Folia), which is actually a set of 20 variations on “La folia,” a musical theme dating back to the 15th Century. Like other composers, Vivaldi sought to emulate Corelli’s version as evidenced by his choice of virtuosic flourishes. Vivaldi takes advantage of the extra violin — provided by Pierson — to engage in imitative play.